Members of the U.S. House Energy and Commerce Subcommittee on Health on Wednesday considered proposed updates to the nation’s law on preparing for and responding to national and global public health emergencies resulting from any chemical, biological, radiological, or nuclear (CBRN) agent, toxin, disaster, threat or attack — be it naturally occurring, unintentional or deliberate. 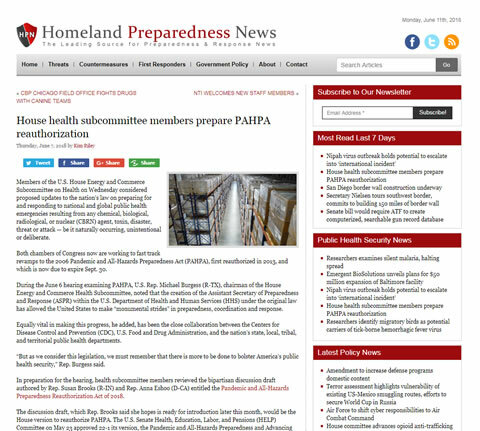 Both chambers of Congress now are working to fast track revamps to the 2006 Pandemic and All-Hazards Preparedness Act (PAHPA), first reauthorized in 2013, and which is now due to expire September 30. . .
next post: What Is a Healthcare Coaliton?